I’m sure most of you know someone a family member or a friend that is nearly impossible to buy a gift for, it seems as if they already have everything. You want to buy them something special, but you just can’t figure out what that perfect gift might be. Well, if that person is a gardener (or enjoys gardens) then we’ve got some suggestions. 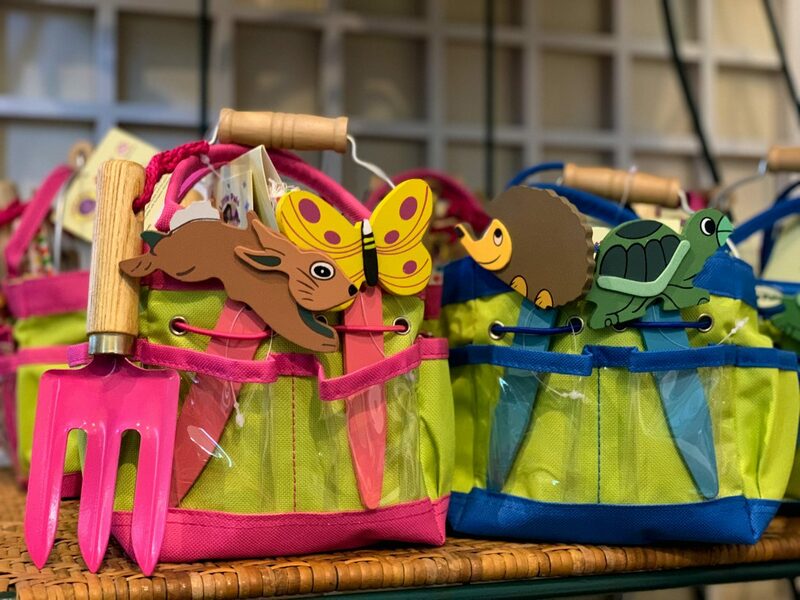 Lewis Ginter’s Garden Shop is overflowing with gifts for every person and occasion in your life. Drumroll….. Here are our top 5 gardening gifts. Chinese watercolor makes this Kneelo Kneeler ($48.95) a perfect gift for your gardener. Add in gardening gloves ($38) and coordinating watering can ($34.95) to complete the set. This beautiful design features Chinese watercolors and hand-colored engravings dating from 1819-1912. The kneeler, made by Royal Horticultural Society, is a must-have for anyone who spends countless hours pulling weeds and maintaining their garden. The kneeler is made with ultra-cushioned memory foam to provide lasting comfort. We also have matching gloves and watering can also great gardening gifts! The Naked Bee hand and body lotion ($16.50) and other assorted salves and products will protect their hardworking hands and prevent cracked lips. If you spend any time working outdoors then you know how much of a toll that can take on your skin. 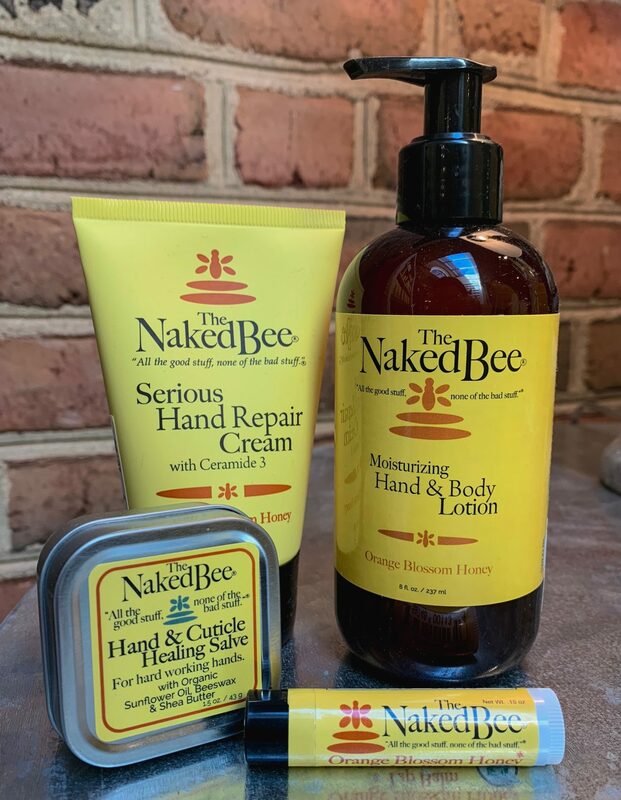 The Naked Bee has an amazing line of products that will be sure to repair those hard-working hands. In order to promote healthy skin, their products are made with natural ingredients such as sunflower seed oil, shea butter, and honey. 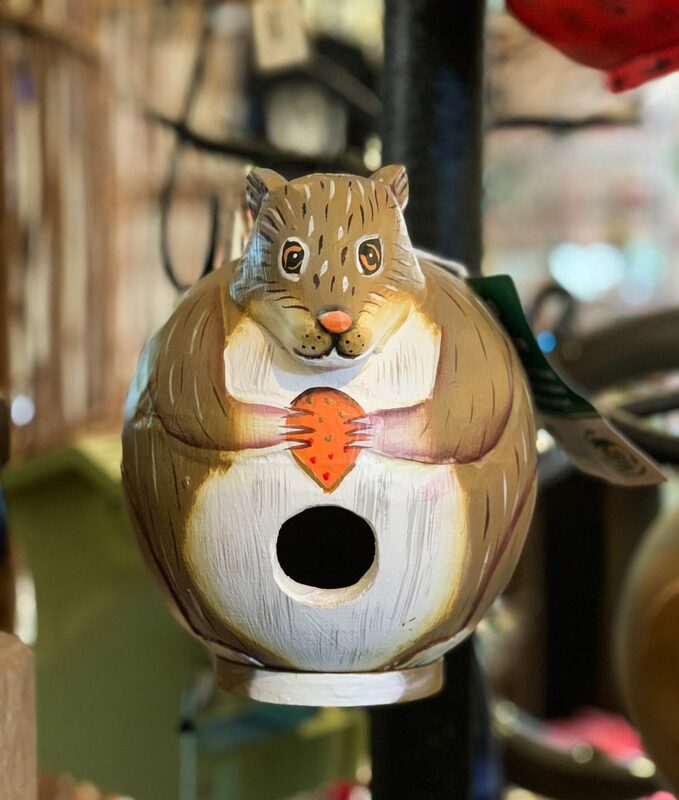 This Gord-O squirrel birdhouse ($42) is just one of many designs in the series. Come see them all! If your loved one has everything for his garden, perhaps the only thing that is missing is birds! With many gardeners removing dead trees or snags immediately due to safety reasons or homeowners association rules, shelter for birds is in short supply. It’s hard to believe that leaving a dead tree can provide more wildlife habitat than a live tree can, but it’s true. Since housing for these magnificent flying creatures is in short supply, why not give a gift that both the birds and your loved-one can enjoy? This cute Gord-O Birdhouse will be a wonderful addition to any garden and the birds will go nuts for it! If you aren’t a fan of squirrels, no worries, this birdhouse comes in many different designs as well. Your young gardening friends will love this Little Pals gardening kit ($36.95). Little Pals Junior garden kits will delight your wee gardener! What could be more precious than encouraging the love of nature and gardening in a small child? After all, gardening teaches more than just patience, appreciation and the rewards of what you sow. Do you know a child that is enthusiastic about being outdoors or that is always wanting to come help in the garden? These adorable kid-sized kits are perfect for little hands. The kit comes complete with everything a beginner gardener would need, including gloves and plant markers. This will surely make a child feel important in the garden. Recommended for children ages 3 to 10. Creative Energy candles start at $11.95 and come in a wide variety of all natural fragrances. 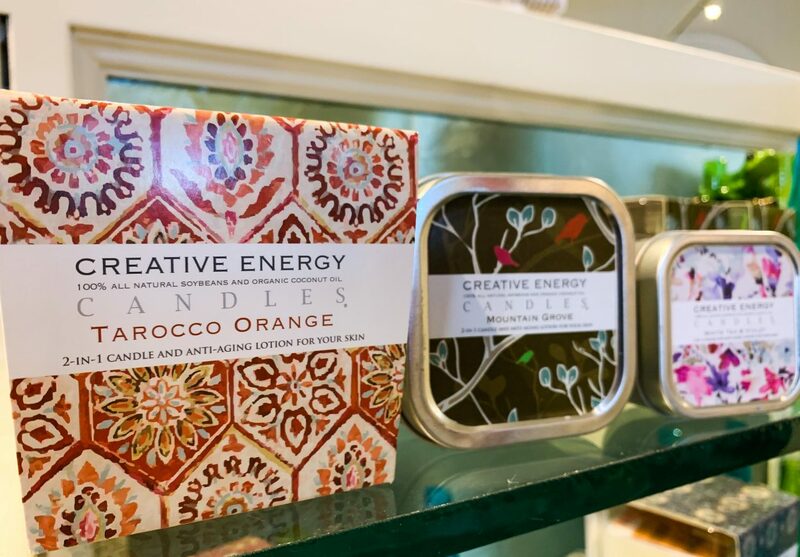 Creative Energy Candles: I am really excited about this gift and would love to see this one under the tree (hint, hint!). If you know someone who loves scented candles but you want to make sure they are burning something safe this is the one to buy. It’s not fun to think about but some candles really aren’t good for you and can let off toxins in your home. Creative Energy Candles are different, they are made with soybean wax, organic coconut oil, and essential oils so you won’t have to worry about a thing. There are so many scents to choose from, you’ll just have to come to smell them all for yourself. You might be wondering how this is a gift for a gardener. Well, these candles have an extra benefit, you can also use the wax as a lotion! We hope we helped you with your gift list! The best thing about our top gardening gifts is that the recipients will know how you took the time to find something unique just for them. Your loved one will think about you every time they put those gifts to use. 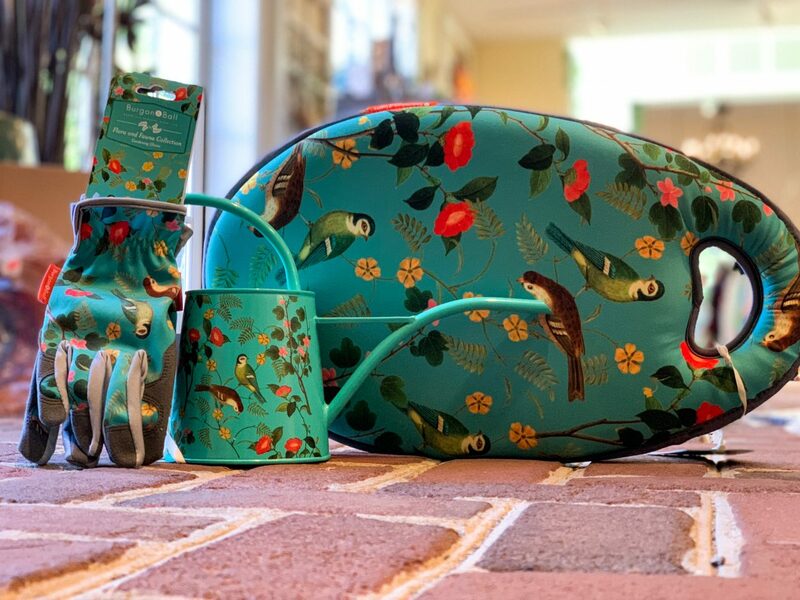 Lewis Ginter’s Garden Shop has so many other wonderful gift ideas, too. When you visit, our attentive staff and volunteers will be happy to help you find gifts for everyone on your list. Join as a Garden Member to save 10 percent in the Garden Shop, and a wonderful 20 percent during our special ShopFest Saturday event. Remember, when you buy anything in the Garden Shop all the proceeds go directly to support our educational mission, so you can feel good about that too!